For the baby boomers born in the late 40’s & 50’s, the outdoor, pioneering, romantic spirit of the cowboy west lies just beneath the surface of their being. Television fare in those early years – devoid of computers, cell phone and Internet games – was unabashedly western. Who among them had not spent countless stare bound hours watching gun smoke, Bonanza, Hopalong Cassidy, the Lone Ranger, Wagon train, Rawhide, Have gun Will travel, Bat Masterson and countless more? No self-respecting kid of those days could be without his trusty six-shooters, cowboy hat, vest, chaps and boots ready for the next game of cowboys and Indians. TV westerns were an audience favorite and thus began our romance with all things cowboy. Well that western cowboy spirit has remained strong through all the years with one of those baby boomers. Gabby la ‘O, is the “sheriff” of Clark El Kabayo Western town. The inspiration to carry out a dream hit Gabby in 2003 while on a US cross-country trip through western towns and dude ranches with his grown children. 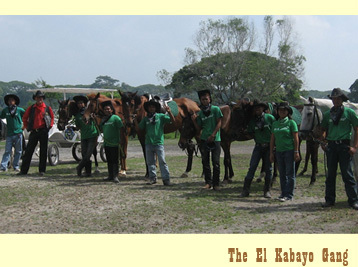 At that time Gabby was already the budding “sheriff” of the El Kabayo Riding stables of Subic. From then on, the dream of building a cowboy town was just a matter of time for one whose Christmas wish list always included the wish for a “real horse”.